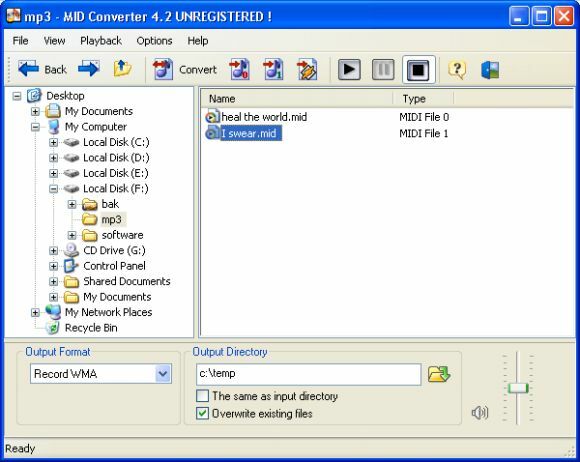 How to convert MIDI to MP3 with MID converter? MP3 is the most common format of high-quality compressed audio on the Internet. It is typically stored as files with the ".mp3" extension. Converting MIDI to MP3 is a frequent task when working with MIDI format files. Here is how to get it done quick and easy. Actually, in order to make MP3 files, the MIDI files must first be converted to uncompressed audio (such as WAV) files. These WAV files can then be converted to MP3. Technically, MIDI can't be "converted," since MIDI isn't digital audio Simply stated, MIDI files have to be recorded. MID Converter is a great tool to make this complicated job easy. Using MID Converter, you simply play the MIDI file while recording. And you don't need to convert WAV to MP3 after MIDI is recorded to WAV, the program does it immediately when you choose MP3 format as Output before recording. Press the "Convert to Audio" button on the Toolbar. After that the Audio Batch Record dialog will be opened. It's very important to correctly adjust the Recording Source settings in this dialog. The Recording Source includes all recording devices which your sound card supports - Microphone, Line In, Stereo Mixer, and so on. The list of devices is taken from the sound card driver on your computer so the device names you see may vary. Select the device you wish to record from. Attention!! !If you playback MIDI through your internal sound card, you should select the "Stereo Mixer" or equivalent in the Recording Source list. Different sound cards have different names for recording devices. For example: "Stereo Mixer" might appear as "What U hear", "Output", "Mixer". Also select the Recording Quality: 44100Hz is CD quality, 22500Hz is FM quality, 11025Hz is Phone quality. Select the Output directory where you want your recorded MP3 files to be placed. Ensure that selected Output file format is MP3. Now the program is ready to record your MIDI files to MP3! 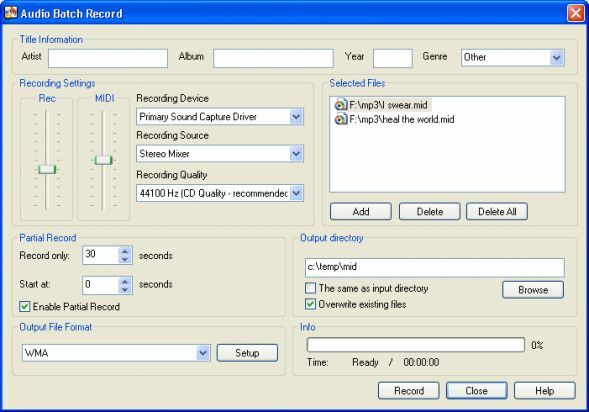 Just press the "Record" button and it will immediately begin converting (recording) MIDI to MP3. This allows you to write the additional information for describing your recorded MP3 files. You can add the information about artist, album, publishing year and genre of the music files. You can adjust the MP3 format options as particularly as you need using Setup button in the Audio Batch Record dialog. There are a lot of available settings including Bit rate, Quality, Mode, VBR Method and Quality, Frequency and so on.